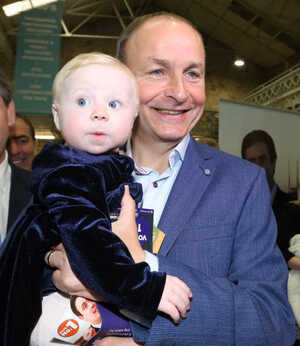 Micheál Martin and Kitty Lee at the Fianna Fail Ard Fheis in the RDS, Ballsbridge, Dublin 4 on Saturday. 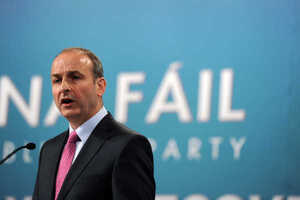 A motion opposing any repeal of the Eighth Amendment [the 1983 constitutional ban on abortion] was carried at the Fianna Fáil Ard Fheis at the weekend. “Since its passing in 1983, the Eighth Amendment of the Constitution (Article 40.3.3) has meant that Irish women receive all necessary medical treatment during pregnancy and at the same time has ensured that the unborn child’s right to life is protected. The reality is that tens of thousands of people are alive today thanks to the Eighth Amendment. Despite the abortion legislation introduced by Fine Gael in 2013 which permits abortion throughout the full nine months of pregnancy in the case of threatened suicide with no medical evidence to back it up, the Constitutional protection contained in the Eighth Amendment must be robustly defended. Posted in Misc and tagged Fianna Fail, Michael Martin at 1:32 pm on April 27, 2015 by Broadsheet. There’s literally no up-side to having FF in existence. Arch-conservatives, really. Everything in Ireland is fine, just tweak here, tweak there. Give me that over abortion any day of the week. Isn’t it nice to have the choice? Why would the LGBT agenda favour abortion? The harder it is to access abortion the more unwanted babies there are to sell to newlywed LGBT couples. Because that’s what this referendum is REALLY about Reprobertie – haven’t you been listening to the Readings from the Book of David? Aren’t you a fella? I’d say you’re unlikely to have an abortion without a uterus. Ah Homer. He always knows what to say. endless supply of these inbred extremist bigots in this country. proof that idiocy is truly non-gender specific. If you think people who are in favour of the protection of mothers and their unborn babies are “extremist bigots”, you really are out of touch with the real world. lol good one!! Keep em coming!! ah yes but what about protection of fathers? a child needs a father and a mother you know! Don’t forgot grannies, they need grannies too! I got carried away and sold my granny for some Denny sausages. *sigh. except the protection of a mother’s right to choose whether or not she wants to be a mother right? That protection doesn’t count cause it’s not in your interpretation of an old book right? How does forcing a woman to continue a pregnancy against her will protect her? Because even for a wanted pregnancy, it’s not easy and it’s not great for the old health. You do know preganncy doesn’t just mean you sit around for 40 weeks and then the baby somehow comes out easily and it’s like nothing ever happened? “Loving them both”, in fact…. Speaking of that, is the child related to the Cowen’s, does anyone know? Aaahhhh. God love her. Big agricultural head on her. Is she George’s daughter, I wonder? I take it you are against the repeal of the 2013 Abortion Act. 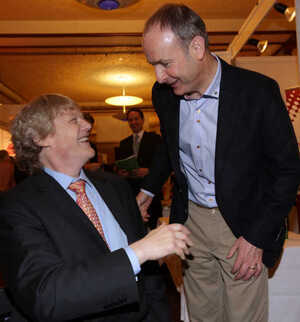 The work of the arch Liberal, and so called “progressive”, Enda Kenny, then Don? I’m for a repeal if you are then going to implement an actual policy that works and has teeth. They made a complete hash of things where now noone gets what they want. Women are not receiving the correct medical care while pregnant, one was forced to carry a baby by medical dilly-dallying, completely unethical and inhumane. He is a gee-eyed gobshite as is the law. From where exactly is this figure obtained? Why do the anti-choice side think women would flock to hospitals to receive abortions if they had the chance rather than it being it a decision that is taken incredibly seriously by, for example, the numbers of women proven through actual empirical research who have to travel to England to obtain the procedure? I wouldn’t put it past them to quote the figure of people born in Ireland since the eighth ammendment came in, though tens of thousands seems quite low for that. But I heard CURA CARES? 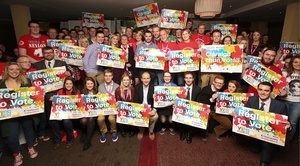 FF to run in NI / UK elections by 2019…. apparently. They’ll find their uber-conservative brethren up there all right. also put manners on the Shinners etc. I’m sure accusing the Brits of their own little “Action T4” would go down a storm there. They intend repealing the legislation for the X case, required after Supreme court ruling 20 years ago? A political party will directly go against the supreme court ruling on constitutional matter? So many issues right there….not to mention lives of women, the tens of thousands who have “traveled” to UK. God, I am so tired of certain sections of our population. No attempt to understand why anyone makes those kinds of choices, nor to address underlying causes.Just the old authoritarian attitude. Go back under your rock guys. actually there was a very interesting article with Anne Connolly a veteral liberal campaigner in Totally Dublin magazine this month. Timmy Dooley hates when he’s picked up like that. I was at the are fheis. this motion was not taken during the health motions workshop and instead was tacked on to the end of the 5pm general motions workshop on saturday. The wording of the motion was “Fianna Fail agree not to repeal Article 40.3.3 of the constitution” , no explanation was given about what that article was , DJ Moore from North Kildare attempted to explain it but was cut off , the vote for this motion was on during the count for committee of 15 which would have loured a lot of delegates away , and a staunch group of pro lifers voted for the motion and it still barely passed. Thank you – for restoring my faith in humanity – I suppose. The real question is how it got on the agenda at all then. You’re all a pack of poo. was it all an attempt to woo that old spuc-er mary hanafin back to the fold, i wonder?